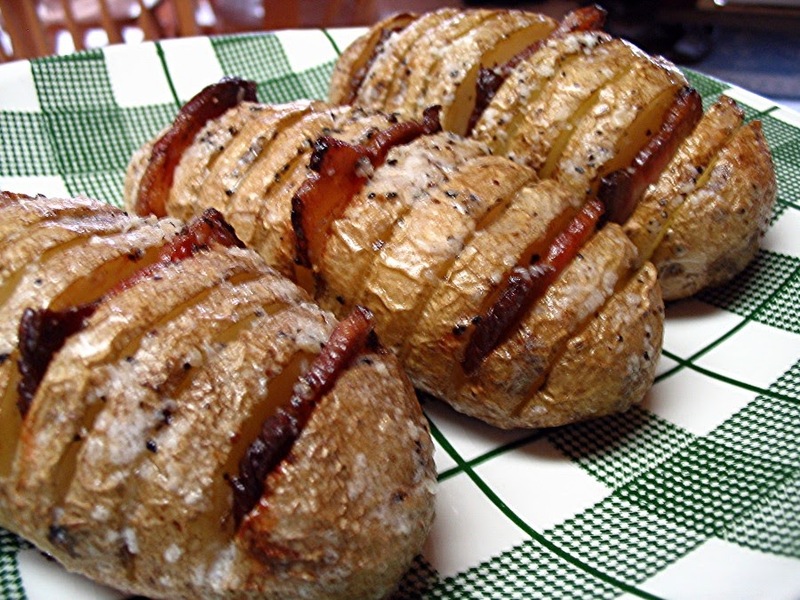 As I understand it, Hasselback potatoes originated in Sweden as far back as the 1700's and there are a lot of variations. 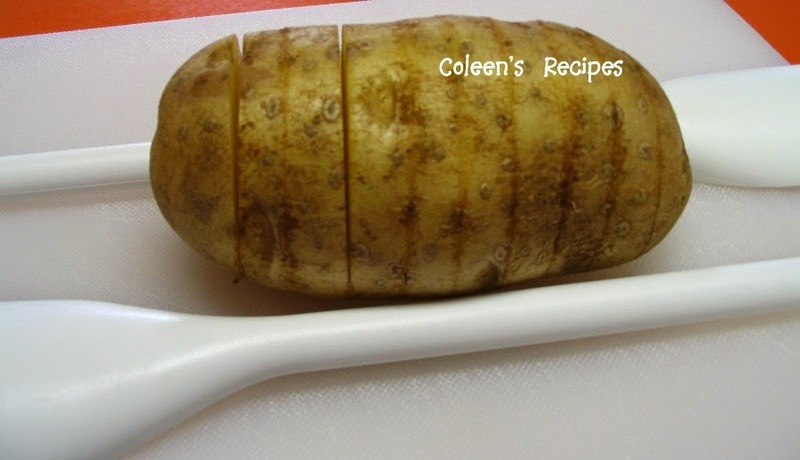 Basically it is an unpeeled baking potato that has been partially sliced, buttered and baked. The outside is crispy, salty and chewy but the inside of the potato is smooth and moist. They are very easy to make, delicious to eat and pretty enough to serve over the upcoming holidays. A word of warning about these photographs: I didn't realize that the photos were on the blurry side until we finished dinner, so I couldn't re-take them. Sorry about that. There really isn't a specific recipe, but I do have a few tips that will help you in the process. 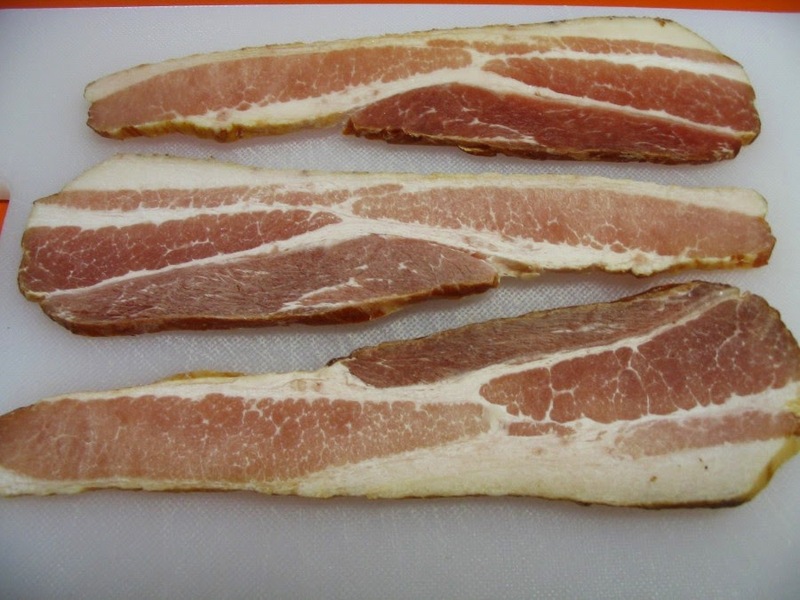 Lay 1 strip of good quality smoky THICK bacon (for every 2 potatoes) on a flat surface and freeze for about 30 minutes. 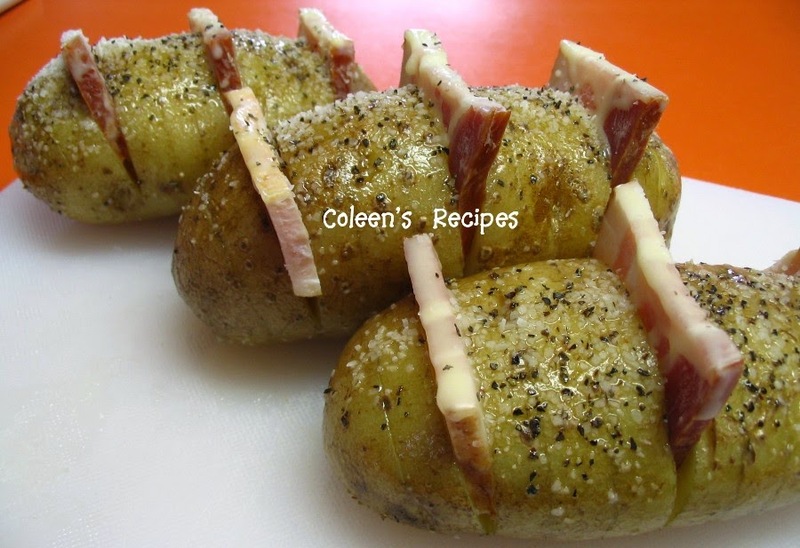 This will help you slide the bacon down into the cuts of the potato. Bring a pot of water (large enough to hold the potatoes) to a full boil. Wash the unpeeled potatoes, scrubbing them with a vegetable brush, then drying them with a paper towel. Next, it's time to cut the slices into the potato. Because it is easy to cut too far, it's better to use some sort of cutting depth guide. Personally, I lay the potato between 2 spoon handles and use a sharp (thin bladed) knife to cut down only as far as the spoon handles. Next, put the potatoes into the pot of boiling water. Let boil 4 minutes for larger potatoes and 2 minutes for medium potatoes. Gently lift them out and pat them dry. Coat the potatoes with melted butter, making sure it gets down into every cut (just don't try to PRY the slices apart too much). After you've buttered the potato, insert 3 pieces of frozen bacon (evenly spaced) into the potato. Make sure the bacon is big enough to be a little wider and taller than the potato because it will shrink as it bakes. Butter again and then sprinkle with kosher salt and coarsely ground black pepper. Bake at 350° (2 hours for large potatoes and 1 1/2 hours for medium potatoes). Dab them with a little butter about half way through. The last 5-10 minutes of baking, melt a little butter and add a finely sliced green onion(optional) and half a clove of minced garlic. Let the garlic toast in the butter JUST A LITTLE, then drizzle the garlic butter over the potatoes and bake a few minutes more. Carefully lift the potatoes out of the baking dish with a sturdy utensil. 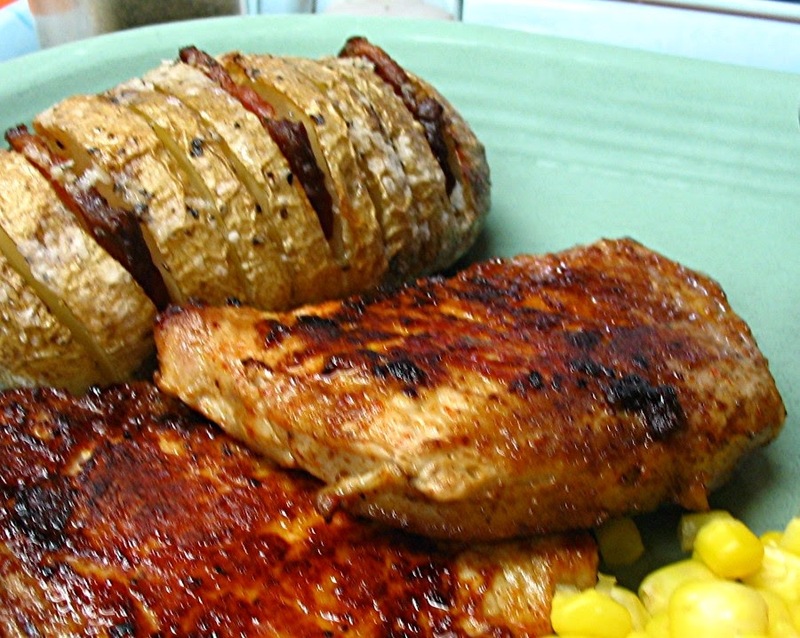 The potatoes have a smooth and slightly smoky flavor. Picky-picky husband loved them. Like I said, sorry about the poor quality of todays photos.